All of our products are sold with closures. Many closures are available with droppers. Child resistant, tamper evident (CRC/TE) available. Our F-217 Foam liner is an excellent general purpose liner. Made of compressible polyethylene foam, F-217 cpas offer a great combination of chemical resistance and odor/taste resistance. While F-217 foam doesn't create an airtight seal, they are generally leak resistant with a low moisture transmission rate. Phenolic cone lined caps incorporate a cone shaped LDPE (low density polyethylene) insert that further seals the lip of the container. This offers an extra level of leak protection. For the ultimate in product safety PTFE or Teflon is often the best choice. 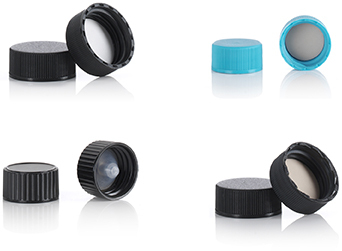 Autoclavable PTFE provides a totally inert inner seal and surface facing the sample or product. These caps are typically used for food applications because it is free from odor and taste concerns. Foil is also useful for non-acid, non-alkaline products and great for organic solvents, chrome cleaners, brake fluids and some essential oils. Our Standard cap outershell material. A dram is many things to many people, but at Discount Vials it is always a measurement of liquid volume equaling 1/8th once or 3.7 milliliters. How big is a dram vial? 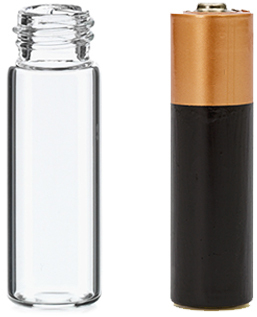 For a quick reference, our 1 Dram vial is very close in size to a standard AA Battery. How much of a solid can I put in a vial? Good question! It depends on what you’re putting into the vial. Putting in gold would be different than filling a vial with cotton balls. For help with solids, we recommend reaching out to us for immediate help at 866-509-1834. For more information or to inquire about samples, please call us toll free at 866-509-1834. Boston Round and Euro Droppers may look similar, but there are some very important differences. What cap should you use? Polycone: perfect for liquids that evaporate or may leak. Teflon: corrosive materials and the ability to autoclave. All the product titles for our caps have the sizing in the title. The first number is the size of your cap (8-425 = 8). This should match the size of the opening of your container. The 425 designation refers to the thread pitch or number of "wraps" on the cap. Sizing is the most important aspect. You will need to know the size of the container opening and the height. 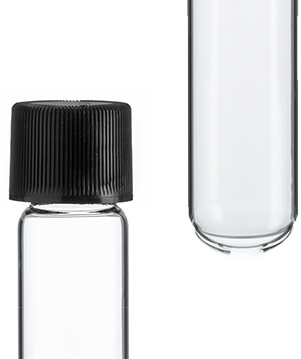 For example, a 13/425x45 dropper will fit a container that has a 13mm opening and is 45mm tall. 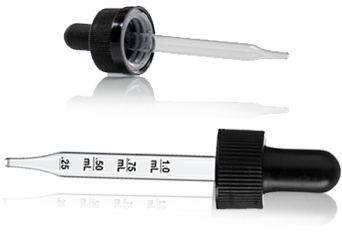 Our standard pipettes are Type III glass and can be ordered with measurements (like a measuring cup). Custom sizes and colors are available. 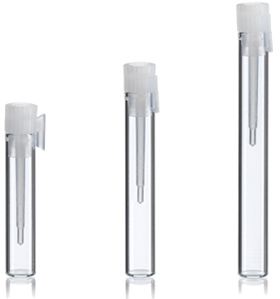 If you would like your logo on the glass pipette, we can do that too! The eye dropper was created in 1905 by TJ Dykema; we purchased his company in 2001. Great for offering small, convenient, single use samples. Crystal clear glass made entirely in the USA. Included plugs are constructed with exacting specifications to ensure a consistent, tight seal 100% of the time. Also available with a spray atomizer. Need your logo, brand name, or other design on the vial? We can do that! Call us at 866-509-1834. A convenient way to apply oils, perfumes, and even lotions. The ball locks into place with an over cap (included) preventing leakage. 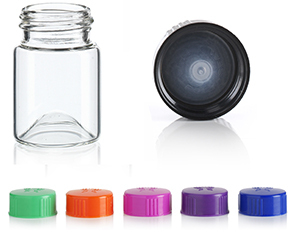 Our 1/6 ounce and 1/3 ounce bottles are available with either a plastic or steel roller ball. If you have a thin liquid, try using the plastic ball, it will prevent the liquid from running too quickly. If you have a thick viscous liquid, try steel, it will dispense evenly. Why choose a test tube? Made in the United States with Type I Borosilicate Glass. An extra tall neck features a 415 GPI thread finish to ensure a tight seal. The rounded bottom allows for the efficient transfer of heat and easier cleaning. 14B Rubber autoclavable caps available for repeated sterilization are available. What’s unique about our wide mouth vials? Concave or “dimpled” bottom of vial creates perfect angles for inking calligraphy pens and brushes. Extra-large opening allows for easier filling and removal of product. Polycone lined for a superior seal. PLEASE NOTE: These vials have an indented/concave bottom. IMPORTANT: Cap colors shown in picture is representative only. Orders will be filled with assorted cap colors. Cap color requests will be honored when possible, please call us toll free @ 866-509-1834 for more information on color availability.